March 20, 2015 – The Mars Society has announced the winner of the 2015 Mars Society Poster Contest. The winning entrant is Ed Sludden, the lead artist for a computer game design company in the United Kingdom. Participants were asked to design a poster that incorporated the theme, “Mars in Our Time,” which is the theme of the 2015 convention. 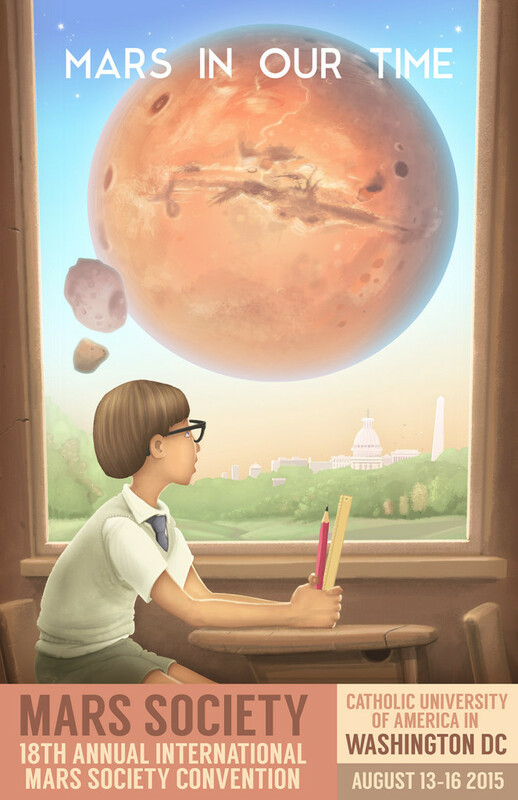 Sludden’s design will be used as the primary promotional graphic for the 18th Annual International Mars Society Convention, to be held in Washington, D.C. from August 13-16. Brian Briones was the second place winner and Scott Porter placed third. An honorable mention went to Juan Nunez.